I acquired my slightly enormous paperback early copy of this book from the Penguin Bloggers Night (I will stop going on about that eventually) and it was one I was particularly eager to read. 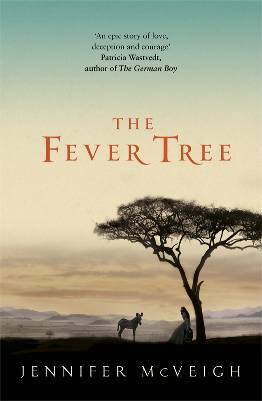 Having enjoyed Jennifer McVeigh’s reading and having chatted with her at the event, I had high expectations for The Fever Tree. Mostly this was because it was set in a world I know nothing about but that appealed to me (in a novel) – 19th century South Africa, a country afflicted with smallpox and plagued by the greed and corruption surrounding the diamond mines. McVeigh carried out extensive research into the lives of those involved in the mining and apparently the initial idea for the book came from her discovery in the British Library of the diary of a young doctor in South Africa. This intense research undoubtedly pays off, making the book as a whole vivid and engaging; but more of that in a moment. The story follows Frances Irvine, a young woman left orphaned and penniless when her father dies. He was a successful businessman, but his bad investments in new railroads mean that Frances is left with nothing. She has suffered all her life from her dead mother’s family discriminating against her Irishness (if you’re Irish, be prepared to be insulted by these charming characters). After her father’s death, and several unexpected events, she is left with two choices – become a governess to her cousins and share a small, dingy house with them and her aunt in the industrial north (a memory of the foul outdoor toilet is enough to turn her against this) or marriage to distant cousin Edwin Matthews, who is a doctor and lives in South Africa. He used to visit when they were children and she has never liked him; but her stern, cruel aunt with her rampant children and tiny, dirty house is a far worse fate. The voyage to South Africa is both romantic and tense. Her emigration (deemed to be the fate of poor, lowly, possibly criminal, people) garners even more disdaining looks, but she makes friends with her roommates and spends her days lusting after the handsome and intriguing William Westbrook. This is the romantic part. The tense part comprises the prejudice of the first class passengers, with whom she is made to dine at William’s well-intended insistence, and her fears about her arrival in South Africa. She fears she will be lonely, that her relationship with Edwin will not develop well, and that they will have no money. She crosses her fingers, almost get swept overboard, shares a few illicit moments, vomits quite a few times, and waits to arrive in her new home. While the section on the voyage to South Africa is excellent, the book gets even better after Frances arrives in her frankly terrifying new home. Better for the reader, that is – for Frances, things just seem to go from bad to worse. She waits in Cape Town for William, but is forced to leave for her to-be-marital home after he delays their meeting. She is already disheartened by this when she arrives at the small cottage, situated in the middle of what is almost a desert. The veldt is wide, flat, dry and humid. Sandstorms happen sporadically, it never rains, and nothing grows; and yet, their cottage is located on what is technically a farm. Really. It is impossible to see how it produces anything. Edwin arrives and they are married, quietly and without much celebration. From here Frances’ experience of life in South Africa becomes increasingly dramatic and based around her physical and psychological – and quite fundamental – reactions to the sufferings that befall her. McVeigh’s writing is vivid and sensual, with descriptions of landscape and physical experience being particularly potent. Frances is in some ways naive and blindly optimistic, but McVeigh’s skills as a writer stop her from becoming annoying. Instead we sympathise with her desperation and disappointment, and suffer with her as her situation changes, worsens, improves, worsens again and eventually concludes (no, I’m not going to tell you how). The Fever Tree has already been described as cinematic, and this is certainly true. Personally I think it would make a brilliant romantic drama, with the actress in Frances’ role being key to its success. The intense focus on her personal experience would mean that any shortcomings in the actress’ performance would have a greatly detrimental effect on the film as a whole. Likewise the depiction of the veldt and later the misery of life in Kimberley would be key – McVeigh describes these so vividly that they are almost characters in themselves. A lot of this story is about the feeling one gets from a situation or place, something that cannot be spoken or spelled out but garnered in a more subtle way from ongoing descriptions or visuals. The end of the story has echoes of Jane Eyre in terms of structure and final resolution, and the story as a whole is apparently of a similar type to Love in a Time of Cholera (I haven’t read the latter, but have been informed of this fact by one who has) – dramatic, romantic, but not sensationalist or too melodramatic. There are elements of melodrama in the landscapes and Frances’ ill health, but like her naive behaviour they are saved by McVeigh’s brilliant writing. Still the melodrama might put some people off but it won’t if you at all like 19th century literature as the tone here is quite similar. In fact, this could easily be a Victorian novel, with its brave heroine, mysterious suitors and sweeping landscapes. No doubt fans of Victorian literature will enjoy it, but anyone else may as well. Not bad at all for a debut novel. Published by Viking, an imprint of Penguin, in March 2012. My copy was kindly provided by the publisher for review. ← Is It Still Wrong To Say Gals? Would you be willing to part with your copy so I may review it?